A good Party Planner or Event Organiser can take all of the stress and worry out of arranging many of the aspects of your celebration. Planners work regularly with local service providers and can quite often help you avoid common pitfalls and offer much-needed advice on ensuring the day runs as intended. 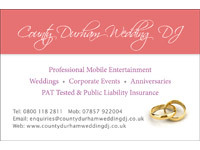 Event Organisers are, by definition, mobile and therefore you should look at the services on offer by planners in adjacent counties until you find one that you are comfortable with. Whether you are planning a wedding for 20 or 500 guests, creating a wedding to remember is a gift that honours all who attend. So where do you begin? And how do you do it without unnecessary stress? Consider hiring a wedding planner or event manager - either full service planning, just the co-ordination on the big day or somewhere in-between. This is one of the smartest things you can do to help create a memorable, unique and stress-free wedding, especially when you consider the cost as a fraction of your overall budget! Once you've named the date for your wedding, prepare yourself a timeline and work backwards to make sure you get everything done on schedule. A wedding planner can help you develop and stay on track with this timeline. Your venue should obviously be your first priority and can be the most challenging - however, UK-Parties has taken a lot of the pain out of researching and features lots of suitable premises in XXXXX for all budgets. Remember that desirable venues are in high demand and as each will have it's own specific contract requirements that you will need to negotiate, as well as rules to follow in terms of outside vendor choices. The best Photographers, DJs and Entertainers for your reception will get booked quickly - often a year or two in advance for popular dates - so these should be your next focus. When looking for a photographer, keep in mind that you will have the images they take for your lifetime: wedding photography is an investment that you don't want to skimp on. You should also really have a natural rapport with your photographer - you are going to be spending a lot of time with them, during intimate and emotional moments and you should feel comfortable with them by your side. If music is a must, book your DJ or musicians fast! Good bands and discos are in high demand. Your wedding planner will be able to create a list of photographers and musicians that are the right fit for you and your fiancé. Eco-friendly events are on the rise. Extend the lifetime of your wedding and the planet by using recyclable invitations, caterers who prefer organic ingredients or support local farms, and donating your flowers and decorations to a local nursing home after your wedding. Wedding planners are in tune with the local vendors who are committed to helping you create an eco-friendly wedding. And finally, try to incorporate elements of your heritage, religion, or create a theme around the two of you as a couple. Forward-thinking wedding planners and events managers like to work with their clients to help them stamp their style and personality onto their wedding. With a bit of intention, you can stay true to yourself and have fun at the same time!